It's really unfair, isn't it? Hufflepuff House doesn't get the respect it deserves. Everyone is always on about Gryffindor being the best house at Hogwarts, but we happen to think that Hufflepuff is the best house. We even put together this little list of 5 reasons to prove it. 1. Hufflepuff has produced the least amount of evil wizards (zero) to date. 2. Hufflepuff badger don't care. 3. The Fat Frier seems like the least terrifying House Ghost to hang out with. 4. They're more humble because they're late bloomers. 5. They're the most dedicated wizards in the Harry Potter series. So, if you've been sorted into Hufflepuff, then you need to stand proud! 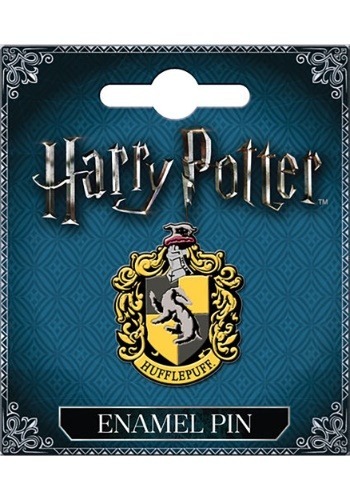 You should be showing off your school spirit by wearing this Harry Potter Hufflepuff Pin. This enamel pin is designed for any Harry Potter fan! It comes with the Hufflepuff House crest on the front, along with a simple tack pin in back. It's about an inch high and has the bright yellows that you'd expect from a Hufflepuff pin. Now you can show off your pride by simply adding this pin to your outfit. Whether you're headed to Hogwarts, or you're a muggle who's still awaiting your sorting day, you'll be happy wearing this licensed pin.